Can you trust slot machine strategies? They’re clickbait, designed to lure you in with false promises in hopes that you’ll generate revenue for the site by clicking on links or banners or something else. They lead to a tiny bit of information and they ask you for money so you can get the whole deal. In the end, both of these are disappointing to the reader who lands there. The truth about slot machine strategies is that if they offer you false hope that you’ll win every time, you just can’t trust them. You can, however, put your faith in smart slot strategies that don’t guarantee you’ll win, but rather that offer you smart advice for doing well over the long run. We’ve got some trustworthy ones right here for you, so read on. You’ve probably heard of setting loss limits. That’s pretty common. For example, you might walk into a casino and say, “I’m not going to lose more than $200” and it’s relatively easy to stick to that if you leave your credit card and bank card back in the hotel room safe. But rarely do people set win limits. It’s a good practice to employ. Instead of just setting your negative limit, set a positive one. So, you might agree to walk away when you’re down $200, but you should also agree to walk away when you’re up a certain amount. That could be $300. It could be $500. It could be whatever you want, but make sure you stick to it or you’ll eventually end up reaching your negative goal. 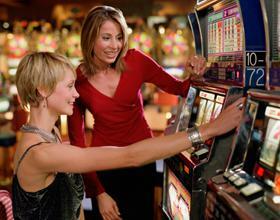 This slot strategy is much easier to employ in the live casino world than online. If you’re heading to Vegas and you know you’ve got $600 to enjoy over three days, don’t bring the $600 to the slots all at once. Instead, drop $200 into three separate envelopes and commit just one envelope to each day. When coupled with a win limit, you can come out ahead big time. If you’re all about chasing jackpots or you love enjoying bonus rounds, it’s important to read the rules of the slot machine before sitting down to play. We’ve seen far too many people sit down to play the slots and wonder why they never get to a play a bonus round while the person seated next to them seems to always hit the bonus round every other spin on the exact same machine. The likely case? You’ve failed to adhere to the rules required to be eligible for that bonus round. It could be as simple as betting the Max. It could be making sure you play all paylines. Whatever it is, you’ll know it if you read the rules. If we’ve got you in the mood for slots, you’re in luck. At Palace of Chance, we’ve got over 100 slot games to play. You can test out these strategies and others you may come across for free with your account, so come play.